With video getting easier to create – and edit – many people are now leveraging the cameras their guests will bring to their wedding (including cell phones) as a source to get some great candid video. In 2017, no moment is “safe”- whether it’s your flailing on the dance floor, the emotional moment when you said “I Do”, or a livestream of your speeches, video is becoming a major part of modern marital memories. But taking video is one thing, and turning into something great is something else entirely. Many people have tons of footage but neglect to watch it because it lacks polish and presentation. 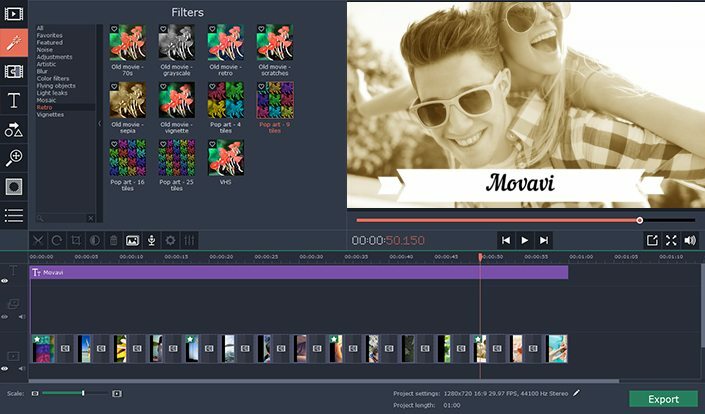 That’s where video editing tools – such as what we’re reviewing today, the Movavi Video Editor – come into play. Movavi is available for both Windows PC’s (Windows 10/8/7/Vista/XP) and Macs. Movavi – a combination of two popular video file types (.mov and .avi) is an affordable piece of software that is quite capable, empowering users to incorporate some fantastic effects into their video (such as video stabilization, slow motion segments, color/tone changes, and more). Introduce some slow motion video effects, such as the bouquet toss or slowing down the moment you broke out the perfect robot on the dance floor. Add some picture in picture segments (a great way to show a speech and the reaction of the bride and groom). Incorporate a host of artistic effects, from changes to color balance to scene changes and even tilt shift. Movavi uses a modern interface that is both visual and intuitive. Video clips and audio files can be dragged and dropped onto the timeline, allowing you to easily sync video and audio (as well as determine placements/transition points for special effects). You can also record video from a webcam and microphone directly into the app. If you want to add commentary to your video, or use Movavi for a blog post/YouTube video/etc., this functionality is quite easy to pick up. I’m one of those “in with both feet first” kind of people, and because of that I tend to bumble my way through learning new software. Thankfully, YouTube is filled with helpful resources. This video by Jeff Curnew made learning the slow motion functions quite easy (if you’re keen to learn, his video does a better job explaining it than I will be able to do here). Movavi also has their own channel and have several playlists filled with videos outlining how to perform certain functions. I recommend exploring this one. When a piece of software is easy to use, powerful, feature-rich, and affordable, there’s little to complain about. You can download Movavi Video Editor for free and use a trial to see if you like it or not. It’s considerably more powerful than the built-in video editing tools in both Windows and Mac, very easy to use, and very affordable (under $50 as of the time of this review). Download it for free and give it a try if you’re wanting to take your wedding videos up a notch.